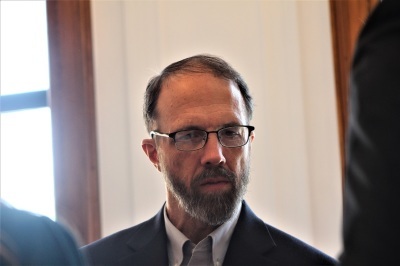 NEW YORK — Nearly five years after the deadly Ebola virus threatened his life and work in Africa, medical missionary Dr. Rick Sacra was honored Thursday with the Rabbi Erica and Mark Gerson L’Chaim (“To Life”) Prize for Outstanding Christian Medical Mission Service, and a $500,000 grant to keep going. Sacra doesn’t think of himself as a hero, but to hear the 56-year-old missionary tell his story about saving lives during the height of the world’s worst outbreak of the disease that claimed more than 11,000 lives, it’s hard not to imagine him wearing a cape. It was August 2014. Sacra, now 56, was delivering babies at the ELWA missionary hospital in Monrovia, Liberia, when he contracted the virus. It had been, he said, an “awful” time in the country he has called home for some two decades. “That was the time when there were not enough beds for Ebola patients. Most of the Ebola care that was happening in Monrovia at that time was happening on the ELWA compound,” he explained at a meet and greet held in the Manhattan home of Rabbi Erica and Mark Gerson, the benefactors of the $500,000 prize. Other medical teams from groups such as Doctors Without Borders had set up operations to help the sick at the ELWA compound but the demands of the sick were overwhelming. “Every day there would be patients. There would be sick people waiting around the entrances to these two units, waiting for news that there was an open bed. It was heartbreaking; you would literally see very critically ill people just sitting out on a grassy spot somewhere on the ELWA compound,” Sacra said. “I remember one morning coming into the hospital and finding out that a woman had died sitting in a chair not too far from the hospital entrance. We had to call in the burial team and the spray team to decontaminate the area. It was a pretty awful situation,” he said. 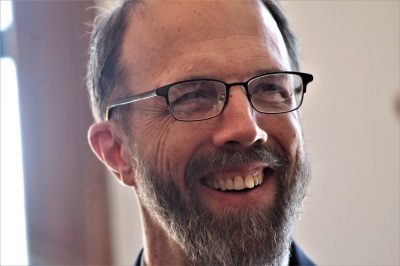 When Sacra got sick he had only been back in Monrovia for about four weeks after stepping in to volunteer shortly after other American medical missionaries, Nancy Writebol and Dr. Kent Brantly — the first two Americans to catch Ebola — became ill.
And he remembers it well. For a time, Sacra remained calm and connected with his wife and employer, SIM. “That weekend, I was in my little apartment; I didn’t go anywhere. I talked with my wife on the phone. I talked with my medical director, my boss Dr. Brown. We decided we’d wait until Monday and do my test on Monday if I still had the fever. The fever didn’t break the whole weekend,” he said. Even though he was sure he was doing what God wanted him to do, Sacra was tortured over what his possible death could mean for his family and the ELWA hospital. He cried as he trusted God to keep him. “I got to meet missionaries, I had some Sunday School teachers and youth pastors who were just very inspiring and really encouraging that kinda fanned that spark into a flame,” he said. One of the stories of the Bible that inspired him, he said, is the story of the good Samaritan. “I still remember hearing a preacher in a Vacation Bible School tell us the story of the good Samaritan. I mean, this was probably when I was 7 or 8 years old, and I still remember him telling that story and how much it meant to me and how I wanted to be like that. I wanted to be somebody who would stop and help my neighbor who was in need. So that just stuck with me and just that desire to want to be somebody that could make a difference,” he said. It’s no surprise then that even after facing death in the field, Sacra returned to Liberia a few months later to continue saving lives. “In January 2015, we had a very ill little 6-week-old boy brought to ELWA, in the middle of the Ebola crisis, with vomiting. He was very sick and couldn’t keep down any of his mom’s milk. At that time, other hospitals were closed. One of our younger doctors saw this child and felt he might have pyloric stenosis. I was asked to take a look with the ultrasound — this was a disease I had not diagnosed before, but we got out the ultrasound book, and looked up how to diagnose it. We took a look and sure enough, it was pyloric stenosis, which requires surgery,” he said. The baby would go on to have a successful operation with the help of his committed colleagues. “It was great to be part of a successful team that God provided for the benefit of this baby,” said Sacra. 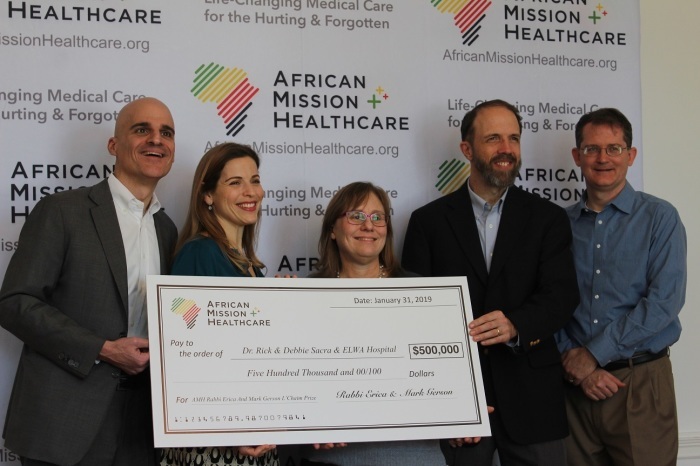 The annual $500,000 L’Chaim prize was awarded by African Mission health care for the third year in a row. The prize from the nonprofit, co-founded by Mark Gerson of Lehrman Group, and his college friend, Dr. Jon Fielder, who has served as a medical missionary to Africa for almost 20 years, will go toward supporting the advancement of health care in Liberia. It will help to cover about 15 percent of the training costs for Liberian family medicine residents. The country, which was founded as a colony of freed African-American slaves in the 19th century, only has one doctor for every 15,000 people, and many of them lack advanced training. “There are many needs to train doctors — library books, internet, faculty to teach, housing. This prize will cover about 15 percent of the training costs for our current group of residents,” Sacra said. The money will also be used to help establish an intensive care unit with trained staff as well as install solar power capacity at the ELWA hospital as a buffer against Liberia’s unreliable power grid. And Rabbi Erica Gerson explained that growing local health care capacity is what the African Mission health care is pushing for. “That means on the capital side, building up the physical plant, which could be anything from putting in proper roads … We’ve had a lot of requests for solar panels so they can have not only consistent power but [so] they [won't have to] spend a fortune on their power,” she said. Providing housing for missionaries is also a part of the multi-pronged approached to supporting local health care systems. “One of the most consistent needs of the Gerson L’Chaim prize over the years has been housing,” the rabbi said. “Even though we’re funding medical expansion, people don’t think about it, there’s no market for rentals. If you can offer someone safe and decent housing, that becomes a real draw. It’s a necessity and it’s a strength when various campuses can build that,” she said. The support of the Jewish benefactors of Christian medical missionaries was forged out of a relationship between Erica’s husband and his Christian college friend, Dr. Jon Fielder. 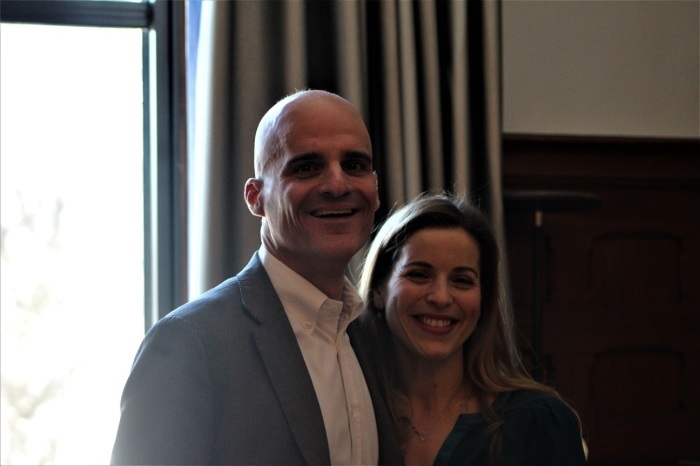 “My husband was at Williams College with Jon Fielder, who then became Dr. Jon Fielder, and on his path he felt a calling to serve God and to do that in his medical capacity,” said Erica. 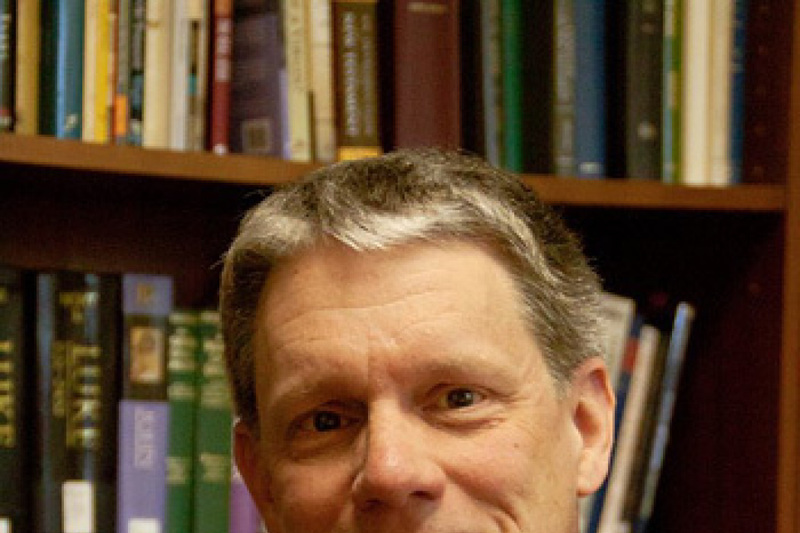 Mark, who would go on to co-found and become the chairman of the Gerson Lehrman Group, a knowledge brokerage and primary research firm, began helping to support Fielder’s work. After observing how the missionaries were operating for a while, the friends teamed up to help make the operations of medical missionaries in Africa more efficient through African Mission health care. “When Mark got on the scene and when Jon got on the scene, these doctors were going back to America for months at a time going church to church, weekend to weekend, raising a few hundred dollars. And Mark, as a businessman, said this is not a good use of human capital,” Erica said. “These are the people who are trained and willing to serve, let’s figure out how we can support them so they can do their holy work in Africa. We can build the relationships and the systems needed to support that work. So it took off from there,” she said. Another reason Erica and her husband say they got involved was because of their faith. “And he’ll (Mark) say that he feels that one of the strongest commands in Judaism is to love the stranger. It’s the most often repeated commandment or mitzvah in the Torah. It’s always, love the stranger, remember the stranger, because you were strangers in the land of Egypt. ... Nothing could be stranger for us than a sick orphan in Africa. We have no personal connection but we recognize their humanity and are inspired by the love and medical skill that all these doctors are bringing,” she said. Mark Gerson also told The Christian Post Thursday that the prize is a reflection of what he sees as the historic friendship that has bloomed between Jews and Christians in recent years. “It’s been over 3,000 years since Moses and God liberated the Jews from Egypt. This right now is the greatest friendship the Jewish people have ever had, and it's with Christians today,” he said. “The Christian love for Israel has amplified the Christian love for Judaism. And the Christian love for Judaism has in response amplified the Christian love for Israel, and it has become a virtual cycle. And that virtual cycle has produced this world historic friendship. In all of Jewish history there has never been anything like this,” he said. The businessman praised the work of Christian missionary doctors and described it as one of the most “spectacular” investments in which anyone could make. “What’s really inspiring is being able to see the places where the Christian missionaries serve is functionally impossible to get to … just hearing about the extraordinary work they do in helping us fulfill our Jewish obligation to love the stranger,” he said. “When you hear about the number of people whose lives they saved, and people whose illnesses they treat and people whose injuries they heal per dollar invested, it’s the most spectacular investment anybody has ever made. And it’s inspiring. "It’s inspiring to think about the amount of good one can do with almost any amount of money that one invests in the work of Christian medical missionaries. It's gonna deliver the best investment return anybody has ever seen,” he said.